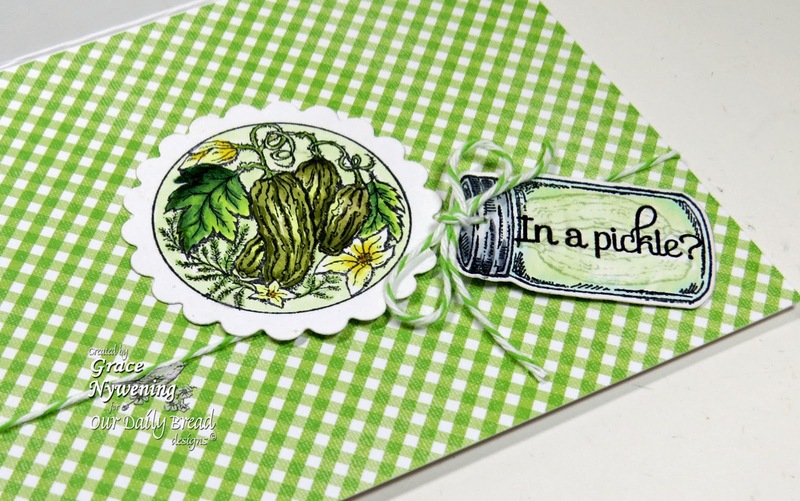 Th-INK-ing of You: In a Pickle? Hello friends! Today I have a card that I made for a couple SCS challenges. One was to make a window card and put the image and sentiment on the inside! Well I thought that might work out perfectly with this cute pickle image from this month's ODBD release, Pickles. I ran a layer of white card stock through my e-Bosser with this leafy vine embossing folder, and cut my aperture with a classic circle lg. by Spellbinders. Then I matted that with this cute gingham dp from Paper Studio. I cut that opening with a scalloped circle large. On the inside of my card, I added another layer of gingham paper, stamped the pickle image with Memento ink, colored with Copics, and cut with the same scalloped circle, and mounted in the center of the card. I added a tag that I cut with the ODBD Canning Jar Dies set (small jar used here), and I stamped the sentiment from Pickles, the Jar from Blue Ribbon Winner, and a couple pickles from the Strawberries and Pickles set. I tied that with a piece of bakers twine. On the front, I decorated the white with a flourish die from the new Fancy Foliage Dies, and added some tiny blossoms from the wedding dept. at Michaels. So this was a fun one! I think the sentiment is a hoot. I also wanted to let you know that ODBD is having a Dog Days of Summer Sale! Check it out HERE! So cute and so pretty. Love this color of green (but I love greens). I always forget the make the inside beautiful. Thanks for this great inspiration. 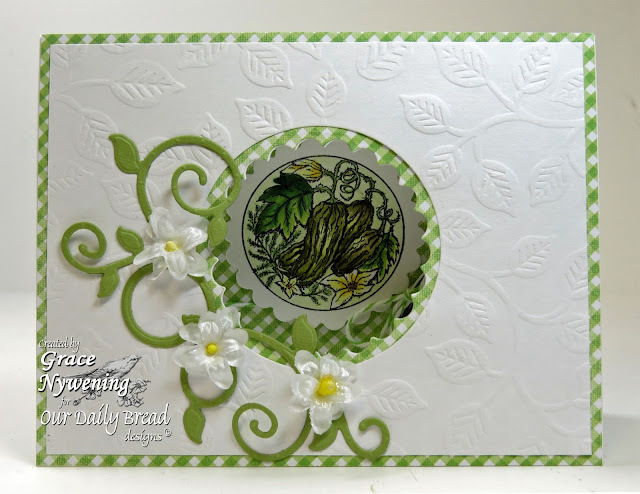 this is gorgeous Grace - love the clesn and crisp green against the white and the way you have taken the dp inside the card. very cute, love your window and embossing! Wow! This is so beautiful! I always love the green and white combination. It is so pleasant:). Pretty white flowers too. A Bushel and a Peck, and a Hug around the Neck! A sneak peek - Ring Christmas Bells! Thinking of You from my Garden! A Look Back at the ODBD August Release! It's All About the Sentiments!